In Ennuigi, players explore the ontological background behind the Super Mario Bros.' tragic and destructive path through the once glorious Mushroom Kingdom with Luigi. Chain-smoking and contemplating the decisions his reckless brother Mario led him to, Luigi seeks meaning among the ruins. Players can only walk, smoke, and ruminate here, but then, what more could one want? Was it darkness, or just the shadow of my brother? He ponders about what is left in this bleak and haunted world. Plumbing the depths of meaning and perspective behind his past actions, Luigi reflects upon things like what wonders might this broken land have once held. Angst and existentialism are abundant in this look inside the mind of the oft-forgotten brother. Profound insights and a sardonic view of one of the most beloved franchises, makes us reconsider how many innocent lives were destroyed by two plumbers in a foreign world, and for what real reason, leaving Luigi merely the regretful koopa shell of a man. Another castle. 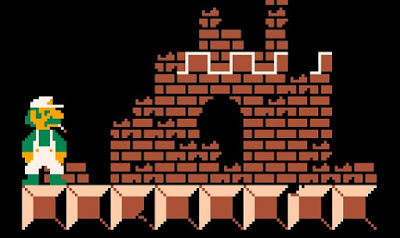 Always another castle. 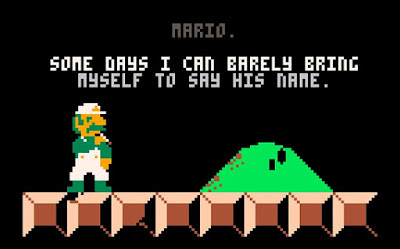 The official synopsis for the game reads, "Spend some time with a depressed, laconic Luigi as he chain smokes and wanders through a crumbling Mushroom Kingdom, ruminating on ontology, ethics, family, identity, and the mistakes he and his brother have made." "This is a shot at a collection of ideas I had a few years ago, about looking critically at the universe of Super Mario Bros. in light of the total lack of explicit narrative in the original game in particular. Who are these strange men? What motivates them? By what right do they wreak the havoc they do on this strange place? What do they feel about where they are and what they're doing? And so, this is one lens through which to look at all that, with Luigi, the second brother, the also-ran, as a complicit onlooker, wandering now through some fractured, rotting liminal place in this strange world, reflecting on it all in scattered fragments." The feel of meandering the desolate kingdom as the despondent, green-clad Mario brother perfectly captures the over-dramatic tortured soul ideology of a teenager delving into the pointlessness of life and, subsequently, life's apparent cruelty. The joy this small game gives me is great. It gives me pause and makes me consider the consequences, the justifications, and the superficiality of the things we help our characters do. What awful things have we wrought, who have we killed, and the greatest question of them all- why?